In 1979, to commemorate 20 years of partnership between the sister cities of Boston and Kyoto, 43 enormous crates arrived at the Boston Children’s Museum. The crates contained, in bits and pieces, a nineteenth-century, kyo-machiya style townhouse of the sort used as workshop and dwelling by Kyoto merchants. Carpenters from Japan accompanied the boxes and spent months in the museum, diligently putting the house back together for permanent display. To think, I have been to Boston several times but would never have dreamed to check the Children's Museum for such a sterling example of Japanese architecture! 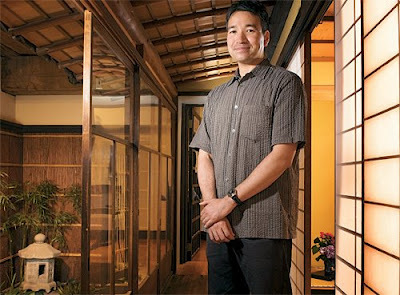 This fascinating article in Harvard Magazine allows Yukio Lippit to put the house in context of the architecture and ecology of Japan. There is also a fantastic clip from the documentary Rebuilding an Old Japanese House, which was made during the reassembly of the house at the museum. The carpenters who accompanied the crated Japanese house are so amazingly skilled that planing a beam looks like they are shaving curls of butter. Mercifully without narration, the only sound is the craftsmen working with the wood.